Founded over seventy years ago to bring tourism to the city of Miami, the Orange Bowl Committee (OBC) each year hosts the nationally televised Orange Bowl football game on New Year’s Day. 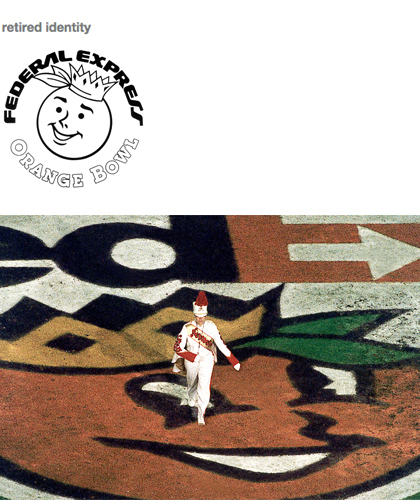 In 1990, OBC extended to Federal Express the honor of being the first Title Sponsor in Orange Bowl history. The new FedEx identity was launched in June 1994. The Orange Bowl visual identity required changing out the old Federal Express logotype for the new FedEx wordmark. After review of FedEx and OBC marketing objectives, it was determined that merely retrofitting the new FedEx identity would not suffice. The Orange Bowl mascot “O.B.” was dated and was being used inconsistently in the many OBC activities. The new Orange Bowl identity contemporizes the New Year football classic and is stylistically consistent with the revitalized FedEx image. A branding matrix allows sponsors, licensees and suppliers systematic graphic connection with OBC appropriate to their respective contributions. Promotional graphic standards provide accurate reproduction of the FedEx Orange Bowl signature and contributes to impeding its unauthorized or inappropriate use.